Arnaud Desplechin's A Christmas Tale is deceptive, but in all the right ways. Its title, along with a quick glance at what it's about, might suggest a warm and witty holiday comedy full of those sappy grasps at understanding family members and fake-heartwarming moments. That's not the direction we're going with this picture, though: Desplechin guides his rather pensive drama through the holiday setting and uses it as little more than a catalyst for a family's dirty laundry to finally be aired. Instead of tapping into easy sentiment, he delves deep into the convoluted nature that really surrounds Christmas among many families -- especially those experiencing a transition. And, within that, he crafts something potent and compellingly natural. Interestingly, A Christmas Tale shares some plot points with the juvenile American holiday rom-com A Family Stone, only the way it's done here emphasizes real, graspable human emotion instead of false sweetness. Desplechin plops us in the center of a family conflict that revolves around the mother, Junon (Catherine Deneuve), struggling with a cancer diagnosis while her children and husband scramble to come to grips with it and find an answer. In order to extend her life expectancy, she's got to have a bone marrow transplant from a compatible donor -- which is rare. 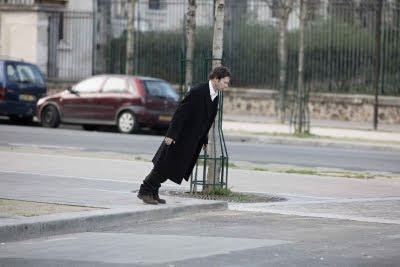 After everyone in the family's been tested, two people are left as options: the mentally unstable son of Junon's eldest daughter, Elizabeth (Anne Consigny), and her estranged, socially belligerent son Henri (Mathieu Amalric) who's at war of sorts with Elizabeth over financial dealings. As suggested by the title, the whole family finds their way underneath one roof for Christmas; however, A Christmas Tale doesn't attempt to approach sentiment anytime near the beginning of the film. Brash humor, both dark and light at the same time, interlaces with the family's bickering, but the overall tone easily resembles that of an disheveled family forcefully crammed together like a can of sardines. Discussions about Junon's illness lace within other secondary issues, like Henri's mental stability after the death of his wife, Elizabeth's depression, and the stirring romantic passion felt between Junon's nephew Simon (Laurent Capelluto) for Sylvia (Chiara Mastroianni), wife to the youngest child Ivan (Melvil Poupaud). It's a complex weave of stories that could potentially get jumbled, but Desplechin is mindful in his construction by only allowing them to get marginally tangled. It also might sound a bit like a melodrama, and it can be at many points, but A Christmas Tale finds a perfect balance between dry wit and weighty drama that replicates what a household can really be like when conflicts are stirring between the family members. Is that a pleasant thing to watch on-screen? Not necessarily. In that regard, it reminds me a bit of Mike Nichols' Closer -- austere and painful to behold, yet warmly resonant with those who have experience something in the same ballpark. That may be where the dividing line lies with Desplechin's picture; those who haven't experienced something like the dour, difficult to-absorb dynamics in the picture might not find much to identify with, while others who have experienced even a flicker of this will see the relevance. A Christmas Tale becomes intimate because of that, heightened by its personal communication with us. Each of the main characters shares a moment where they break the fourth wall and communicate with the audience, all in direct fashion where they pour our exactly what they've been thinking, feeling. Junon talks about the history behind her home, while Henri and Elizabeth talk about their experiences with childhood. They look openly at the audience and speak from their hearts whilst completely taken by their intriguing characters. It's a tactic used to avoid narration, one that gets their overlapping contemplations communicated to us without feeling haughty or fake. And it works, as each and every one locked in my focus from the get-go. Part of what transcends A Christmas Tale into polarizing territory is the broad range of exceptional performances, ones that teeter along a very fine line between identifiable entities and slight caricatures. They build a family dynamic that's neither completely disjointed not cohesive, wedged right into that gray area sandwiched between the two. Catherine Deneuve plays her role as Junon with restraint and grace, squashing any brashness of character into a cool and calculated demeanor. She's the cornerstone for the film's manner, and a slightly chilly yet tender disposition pours over to the rest of them. It's especially prevalent with Mathieu Amalric's mesmerizing turn as the drunken, harsh Henri, who's more compelling and richly layered than we'd expect at first glance. Henri and Junon share a scene together over cigarettes in the frigid weather outside the family home where they discuss their relationship, fully acknowledging their discord with each other -- not for what each of them have done, but simply based on their merits as people. Since he's one of the only probably donors, it creates a fascinating dynamic between the two that builds further as time passes. Amalric and Deneuve, however, don't share nearly enough sequences with one another, as this gravitational dynamic between them only experiences their outdoor scene, one or two moments within, and a payoff in the conclusion. That's a testament to just how good their rapport is: we want more of it. Within its depth and natural human interaction -- on top of an unusual visual and editing manner -- the way that it eases into Christmas Day is breathtaking. Through strategic title cards illustrating the days leading up, it eases us through the process of culturing the family to the idea of Junon's bone marrow transplant -- and who'll be her donor, if she elects to have the procedure. Interactions grow harsher and boil to a fuming head, as the whirlwind of conflicts intensifies with each scene. It all boils to a rather cathartic and seamless ending, sentimental in a coy and smarmily pragmatic kind of way. Most importantly, the conclusion in A Christmas Tale is, well, inconclusive in its catharsis, weaning us away from a saccharine wrapped-up-in-a-package finale by reminding us that things often don't simply reach 100% at the end of a visit with the family. Hollow pains stick around and strings remain unstrung, but a sense of warmth-infused optimism can be felt as the rift eases.